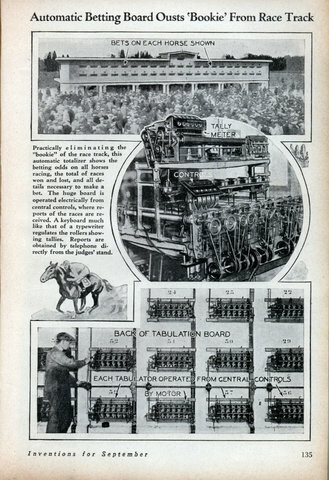 Practically eliminating the “bookie” of the race track, this automatic totalizer shows the betting odds on all horses racing, the total of races won and lost, and all details necessary to make a bet. The huge board is operated electrically from central controls, where reports of the races are received. A keyboard much like that of a typewriter regulates the rollers showing tallies. Reports are obtained by telephone directly from the judges’ stand.